Dinner with a view of the Eiffel Tower, anyone? 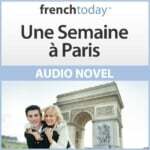 Here’s my newest discovery in Paris: the restaurant “les Ombres” in Paris. 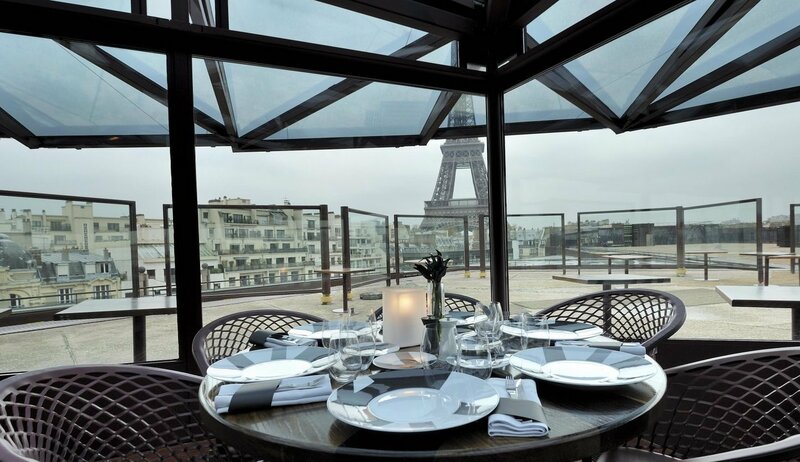 A bit expensive, but fantastic cuisine and the best view in Paris! 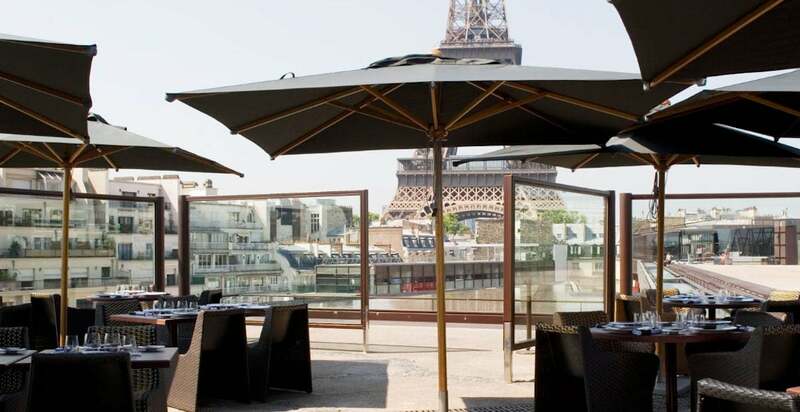 On a warm summer evening, I gazed at the glittering Eiffel Tower from the terrace of Les Ombres Restaurant, sipping an aperitif of Pommery Blanc de Blanc champagne with a friend. What a special combination: a spectacular view of the Eiffel Tower – only a few hundred yards away and twinkling every hour on the hour – with French cuisine and wine! Inside the restaurant, our table was waiting. After being seated, the sommelier, Christophe, suggested a bottle of Chateau Roubine rosé to begin. Deborah and I were in the habit of drinking rosé everywhere we went, so why not? We couldn’t resist another good bottle of it, especially on a perfect Parisian evening in the shadows, les ombres, of the Eiffel Tower. The wine was crisp, light and chilled to perfection! 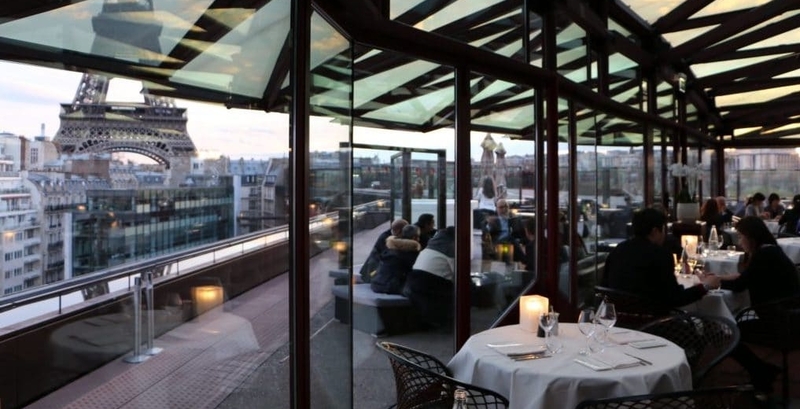 Les Ombres is a glass-enclosed restaurant located on the top floor of the Musée du Quai Branly, in the 7th arrondissement. Interior dark metal support beams highlight the modern architecture and arch across the glass of windows and ceiling, contributing to a grand décor. Even the water glasses are oversized. Our serveur, Franck, greeted us with, “Bonsoir, Mesdames,” and explained the offerings of the day’s menu to us. The food on the tables nearby looked like small works of art and we gazed around at the other diners trying to decide what to order. We knew that we were going to experience an epicurean evening. For an entrée, which is really an appetizer to Americans, I ordered la salade de légumes croquants au sel de sésame fumé, et huile parfumée à la truffe (14€). The description of fresh vegetables in a pastry crust dusted with smoke sesame salt and truffle oil matched its exceptional taste in every way. My choice for the plat principal (main course) was turbot le rôti aux cèpes et cantal, galette bretonne émulsion au beurre salé. (45€). The light and delicious crepe was sublime with the cèpe mushrooms and cantal cheese , which tasted of butter and earthiness all at once. There was a little bit of room for dessert and I couldn’t resist chocolate and vanilla cream. Le cube très moelleux au chocolat Nyangbo et cremeux vanilla , 25€ was artwork on my plate. But I didn’t hesitate for a moment – well, maybe long enough to take a picture – to delve into it and savor every last morsel. Sated and satisfied after dessert – bien sûr – we stepped onto the terrace once again to sip a Porto Andresen Tawny Reserve and stare at the iconic symbol of Paris. I can never get enough of the Eiffel Tower! An evening at Les Ombres is a dreamy “dining with a view” experience that will put a smile on anyone’s face. When I go back to France, which is never soon enough for me, I’ll anticipate dining once again under the stars and twinkling lights of the Eiffel Tower. Yes, I’ll go back every time, there’s no doubt!